Ecofriendly is a trend, a trend for the better, because it assists in conserving the very source of our existence-Environment and as Albert Einstein had once said “Environment is everything that isn’t me”. It takes a lot to protect something that isn’t you. But there is a significant wave to go green, embrace Mother Nature and nurture the same by resorting to Ecofriendly products. This generation is extremely eco conscious and has been doing their bit in conserving and protecting their surroundings. Technology has also adapted itself in becoming more eco friendly by making gadgets that help us be a part of this consciousness in style. Below are a few eco friendly gadgets that will help us walk through the green mile and inspire us to remain green. This portable charger brings you closer to Mother Nature with nature’s unlimited energy: Sunlight. Sunlight has been a source of energy for several years for numerous products. This portable solar charger from Ravin is smart and simple to use. It needs to be charged for 12 hrs approximately by solar which can effectively in turn charge your Smartphone, PSP, Mp3 player or camera up to two times . The charger has a solar panel made with monocrystalline silicon and weighs only 125gms.The LED indicator shows the power level and the charger can run for more than 500 cycles. This charger will help you remain in touch with friends and family by keeping your phone charged anywhere under the sun. These USB powered rechargeable batteries are much more eco friendly since it replaces the alkaline batteries and their toxic ingredients. USB Cell can run up to 500 cycles, and when it runs out of power all you need to do is pop the top to expose the USB connector and plug it onto a laptop or any other portable USB charging device for a quick refill. With the new Canon Digital Rebel XT, Canon has taken a step to be part of the Go Green wave. This 8 Mega Pixel D-SLR is 13% lighter and with its low power circuit design consumes 35% less power and has an amazing picture quality. This sleek and slim note book from apple has earned the EPA’s energy star qualification, the materials used in designing the laptop has fewer toxins than that of other laptops. It is made up of aluminium which is recyclable and reusable. It has a mercury free backlighting and the display glass is arsenic free. The total weight of the product is 1.06 kg, it has an 11.6 inch display screen, 2 GB RAM, 1.4 GHz core 2 duo processor and a NVIDIA GeForce graphics processor. This amazing keyboard is powered by the solar energy whether you are working outside or inside, it is only 1/3 inch thick and 2.4 GHz wireless. It is easy to operate and also gives you freedom from wires and batteries. 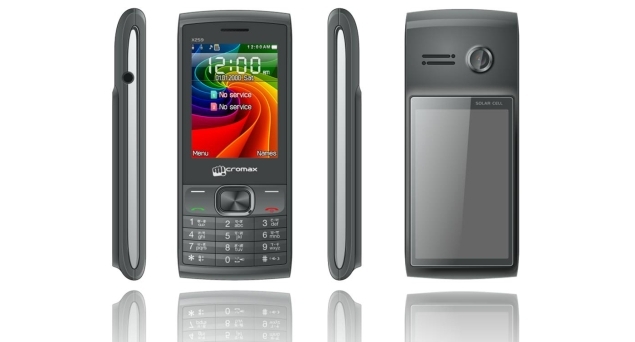 It is a solar-powered cell phone with a 2.4" colour screen, a camera, Bluetooth connectivity, radio capability, and a dual SIM setup. The phone gives the users a talk time of 90minutes on being charged for 3hours and is useful in places where sunlight is abundant as opposed to electricity.